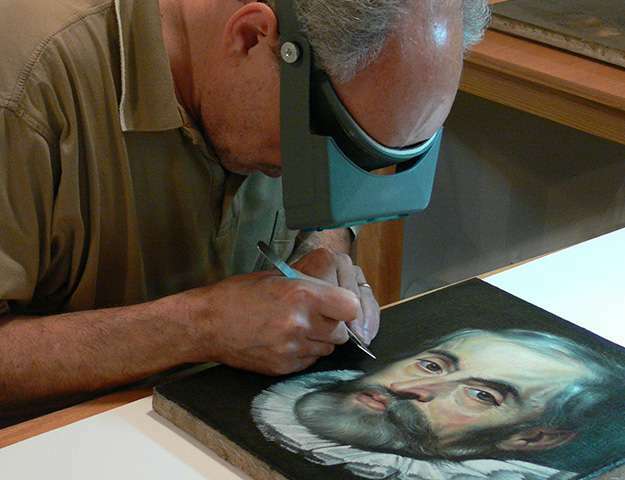 Conservator Gianfranco Pocobene taking a cross-section sample from McMaster’s painting from the Workshop of Peter Paul Rubens. 'Some of these paintings are more than 300 years old and we are untangling some fascinating information,' says Carol Podedworny, director and curator at the McMaster Museum of Art. A new exhibit at the McMaster Museum of Art brings together years of painstaking research by an international team of scientists, engineers, conservators and art historians who have used sophisticated equipment and techniques to uncover new details—once hidden to the human eye—by some of history's greatest artists. The exhibit, titled The Unvarnished Truth: Exploring the Material History of Paintings, literally goes deep below the surface, revealing the findings from the technical analysis of nine paintings, which include a Van Gogh, Van der Neer and Jawlensky. Each was chosen from the Museum's permanent collection based on its composition, the artist and its history. The project has been a labour of love for McMaster's Brandi Lee MacDonald, a research associate in the Department of Medical Physics and Applied Radiation Sciences, who came up with the idea in 2010. As an expert in pigment analysis, she saw the potential to use sophisticated yet non-invasive techniques, statistical information and comparative analysis to answer important questions about significant pieces of art. "By analyzing the chemical make-up and the composition of the paintings, we get a full perspective of the work," explains MacDonald. "We have uncovered new information about the properties of pigment of the paint, the grains of the wood and learned much more about artistic techniques." For each piece, researchers set out to answer several questions centred on painting techniques and materials, attribution, condition and stability. They used x-ray fluorescence, infrared reflectography, even neutron radiography conducted at the McMaster Nuclear Reactor, each used to see beneath a painting's surface. Each piece revealed its own surprise. In the case of the Van Gogh painting "Untitled, Still Life: Ginger Pot with Onions," multiple analytical techniques confirmed the presence of a painting underneath that may have been discarded or scraped down. Van Gogh is widely known to have recycled canvases for financial reasons, and is thought to have abandoned an earlier composition in this painting. In other works, researchers discovered the effects of previously unknown damage and alterations. Analysis of "Portrait of a Man," attributed to the Workshop of Peter Paul Rubens, revealed significant damage around the edges of a famous portrait of Maximilian, the Archduke of Austria, suggesting it was likely cut or cropped on all sides. "Some of these paintings are more than 300 years old and we are untangling some fascinating information," says Carol Podedworny, director and curator at the Museum. 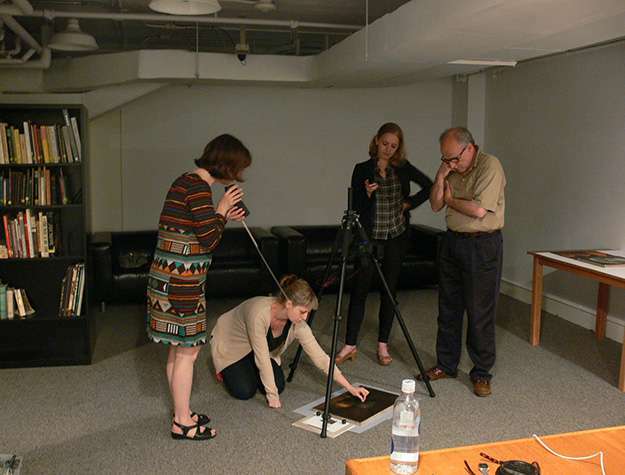 "Having access to the expertise of so many researchers from all over the globe has been an invaluable resource and has both answered and raised some interesting questions about these paintings that are important to the art world."